Story Time: The Nightmare Experience of Buying My First Car! On the 17th February I passed my driving test on the fourth attempt, and it's still sinking in that I actually managed it. It's fair to say that driving doesn't fall within my natural skill set- I've never been a very practical/ manual person so there were times when I wondered if it was ever going to happen. In fact, when the examiner told me I'd passed I burst out crying! I had it in my head I was going to be need about twenty driving tests, so the relief was unreal. I have a new found respect for anyone that can drive a car, people make it look so easy but it's not until you come to learn yourself that you realise just how much goes into it. When it came to buying my car, it wasn't exactly plain sailing either. 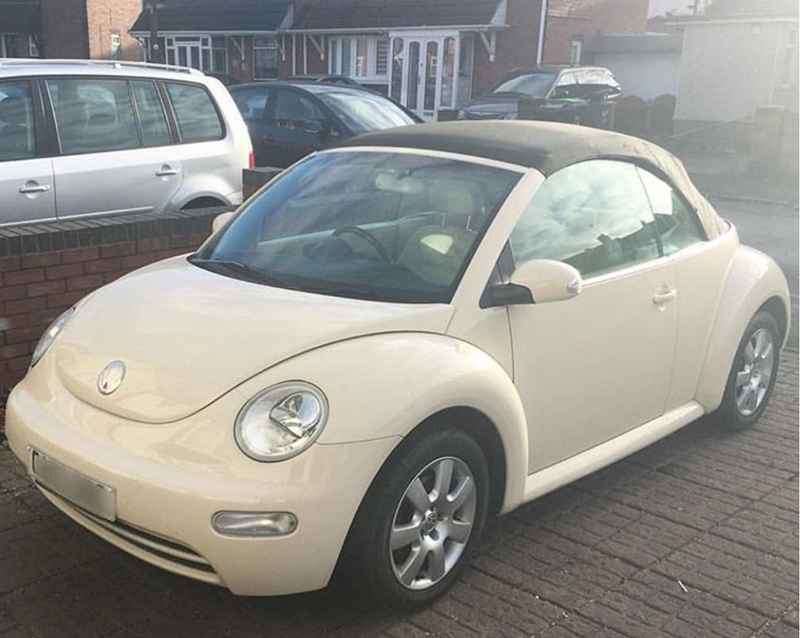 I've always wanted a Volkswagen beetle, so when I spotted one within my budget not too far away I was obviously thrilled. I'd been saving for a little while so it felt like it had come along at exactly the right time. Me and my friend hopped on the train and went to go and have a look. The problem is, I know nothing about cars (and they weren't much more clued up either since they'd only ever driven their own car). So when we arrived, other than a quick check over it there wasn't much we could really do other than hope for the best. The garage did find that when they came to start it the battery needed jumping, maybe this should have been a warning sign. However I was assured it was just because it had sat unused for a while and this was pretty normal. In hindsight I wish I'd done some research and known the kind of things to ask, because I was way out of my depth. After making the payment and going through the paperwork (including a day's insurance for my friend who was driving it home for me) we set off to make the forty or so minute drive back home. On the way out of the car park he did comment that the steering felt a little heavy and that it didn't feel like it had power steering- little did we know that was another clue that things weren't quite right. Ten minutes down the road, the battery light flashed on the dashboard with a beep and we both exchanged concerned looks. Seconds later, the car cut out completely. Unfortunately we were in the middle lane of Islington Row which is an extremely busy road in the middle of Birmingham, a stone's throw away from Broad Street. It was dark, buses and cars were speeding past each side of us at 40mph, as well as those in the middle lane having to swerve around us. I can honestly say I was shaking with fear, the car was so dead the hazard lights wouldn't even come on. Cue loads of angry drivers beeping and shouting, not understanding why we were stopped dead in the middle of the road! on the pavement after being pushed to safety, with the help of a passer by! In sheer panic in the middle of traffic, I made a frantic phone call to the AA. They were useless, and absolutely no help whatsoever. In fact they refused to even send someone out until giving me a ten minute 'safety' lecture, bear in mind I was terrifed for our lives at this point. Nothing was going in, I just wanted them to send help! In the end someone driving past parked up around the corner and ran back to help us push the car to safety on the pavement- he was an absolute lifesaver. We called the garage I'd bought it from who took it back and repaired it, before delivering it to me the next day at my house. It turns out the alternator had gone and wasn't charging the battery, which explains why it needed jumping to get started initially. Because it was dark and we had the headlights on, the small amount of power from the jump start quickly drained leaving us stranded with no power in the car at all. I dread to think what would have happened if we'd made it onto the motorway. Since the car had recently passed it's MOT I don't think it was anything dodgy on the garage's part and they were helpful in getting it picked up and fixed. But it just goes to show that all it takes is for one part to go wrong and you can be left in such a dangerous position. When you drive I think it's important have a basic understanding of cars, I wish we'd have known more and I'm going to try and learn more for future reference. For example the heavy steering was a big indicator that there wasn't enough power, as the power steering hadn't kicked in. If we'd have known that, we could have had the problem sorted before even driving out of the garage. Another thing you can do is get your car regularly serviced, don't wait for things to go wrong before having it looked at. You can book full service of your car from Fife Autocentre or any other Autocentre nearby to you. It's so worth doing since any problems can be spotted early, preventing breakdowns or causing further costly issues. Everything is fine now, my car is running perfectly and I'm finally out on the roads on my own. I'm still not the most confident driver in the world, but hopefully that will come in time! The whole experience gave me a massive fright, it's something I just never expected to happen. If you're buying a new car, take my advice and go with someone who knows the ropes with these things. And be sure to properly maintain your car to avoid getting in a situation like I ended up in. If someone would have gone into the back of us while we were stopped dead, not only could we have been badly injured but the car could have been written off before I’d even driven it. Have you ever experienced anything like this? Oh bless you, I really feel your pain. My first car was a Fiat 500, bought from a garage. It didn't die straightaway but I only managed 1000 miles in it (and bills totalling £2600 by that point!) before it broke completely and would cost £3000 to fix. It was the most stressful time of my life! I'm so glad yours is working fine now, I know how much of a headache it causes.